It’s Hangover Thursday, how’s your head? I drank enough last weekend that I figured I’d let my liver have a break this week. So my head is nice and clear this morning. I am very excited because I’ve found out about Trooper Ale. Trooper Ale is a collaboration between Robinson brewery and the band Iron Maiden. Iron Maiden was a huge part of my life during middle and high school. It still makes me smile every time I see Eddy, the band’s mascot. 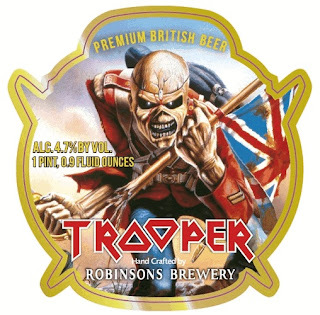 Trooper Ale is supposed to start showing up in America sometime in August. The British Ale is already being sold in Europe and is selling extremely well. They managed to sell a million pints in the first 8 weeks that it was available. Sweden sold 20,000 bottles on the first day. There is a long list of US distributers that are going to be picking Trooper up, so make sure to ask about it at your favorite beer store. Oooh! that sounds like it Rocks! August is around the corner too!